ASAP Pest Control Gwinnett and Hall County: Your termite inspection, removal & treatment experts! Local exterminators & termite control in Buford, GA - call ASAP! ASAP Pest Control offers a variety of termite and pest control services for residential and commercial establishments. The Termite Control Buford GA Experts - Termites can be a huge problem for those who live anywhere in the south. Current research shows that there can be up to 60 – 70 colonies of termites per acre of land. A single colony may consist of over one million termites, so it is easy to see that these insects can create plenty of problems. Termites cause millions of dollars’ worth of damage each year by eating and destroying the wood in homes and buildings. Concerning termites, it is not a matter of if your home will be attacked- it is a matter of when. Homeowners living in the area need Buford termite control or they risk serious damage to their homes. Members of termite colonies are divided into groups. The workers are generally the largest group. These insects are responsible for feeding every member of the colony, and they are responsible for the majority of the damage done to buildings. 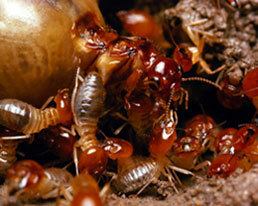 Our exterminators offer termite control solutions. Our goal in termite treatment is to offer the homeowner the best possible solution that meets their specific needs. Both options serve as effective methods of termite removal. We will choose the option that we feel will be the most effective, and our staff will continue to work until your problem is solved. It is our goal to provide you with the best termite control Buford GA has to offer. Liquid Treatment: We use non repellent termiticides such as Termidor and Premise. Older types of termiticides repelled termites but didn't effectively eliminate them. Non-repellent termiticides are not detected by the workers of the colony, so they walk through the chemicals and pick up some of the molecules. When the workers feed the queen and other cast members, they pass some of the product to the other termites. Termites are very social, and since the product is not detected by the termites, they easily pass it on to the other colony members making this a highly effective of termite treatment. We always educate homeowners on their options and allow them to choose what they feel is best for their unique situation. Either way, our exterminators in Buford GA will provide you with a thorough termite inspection ridding your home of these wood destroying insects. Call today and schedule an appointment to receive the termite inspection you need. We offer a repair warranty for most homes. Contact ASAP Pest Control for all your termite Buford GA needs! Superior pest management - If you have termite problems, contact the Buford control experts! Providing exceptional termite removal services. These guys are great! It is rare to find a company that puts honesty as the Number 1 Priority! Thank you James.